Just unveiled officially earlier this week in Geneva, the new 5235 Annual Calendar Regulator contains the new 31-260 REG QA (which obviously stands for regulateur quantieme annuel) movement. Though based on the classic microrotor cal. 240, the new 31-260 movement is vastly reworked. It is the first new Patek calibre to designed to use the Spiromax hairspring and Pulsomax escape wheel and anchor, which are etched from silicon. In addition to the silicium parts, the new movement has some interesting features. Most notably it beats at 3.4 Hz or 23,040 bph, which allows for a better rate. Alongside that Patek has also increased the power reserve to 60 hours (vs 48 hours for the 240) and installed a gear train with new teeth profiles on the wheels for better energy transmission. The new calibre is 5.08 mm high and 33 mm wide, while the watch itself is 40.5 mm in diameter and a slim 10.65 mm high. 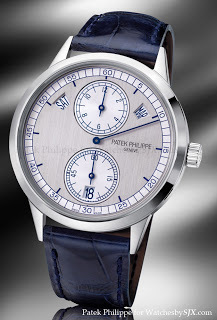 This is also the first regulator dial contemporary Patek Phillipe I believe. The last Patek with unusual time display I can recall was the jumping hour ref. 3969 made for the brand’s 150th anniversary in 1989. Based on the stock images I don’t appreciate the look of the new calibre, especially the slim hands and large annual calendar windows. But the new calibre is interesting technically and I like the elegant shapes of the bridges. The bridges look to me to be a modernised Geneva style, with separate bridges for the going train wheels but not in the traditional shape.